Try Sample of Unique Emails with different Sliders in Email in your inbox. Your message was sent successfully. Please check email for Slider Sample. With the intensity of competition growing every day, it is very important to create unique content that is relevant and interesting for the readers. Sliders can help companies to generate curiosity by showcasing all the important products or services. Retailers can showcase all newly launched products in one email at a go. Ecommerce websites can use sliders in their emails for a number of reasons like displaying multiple products, recommended products, client testimonials, etc. Banks can promote various offers and plans through sliders. Technological companies can display their coupon codes and offers for different industries. Automobile companies can display various features and parts of their automobiles. Tour & Travel companies can share their newly launched travel packages as well as offered discounts. Even industries like home décor and healthcare can use sliders in email to showcase their products and services. 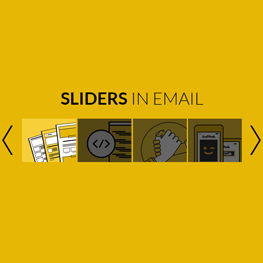 Most email clients like Apple Mail and Thunderbird support sliders. Other email clients will provide a smooth and proper fallback of the slider. If you wish Monks to build your Email Template using Sliders.